Whoa, it seems like forever since my last post. Since the Bit Bazaar ended, I’ve been focusing my attention on many things, some regarding Gonna Catcha and some not. But there’s no time to explain them all here, so I’ll pick the most important one. As I mentioned in my last post, Gonna Catcha was played in an arcade-style environment at the Bit Bazaar on December 7. Players weren’t be able to read the manual to figure out how to play the game, as it wasn’t available to them. So in an attempt to minimize confusion, I added the instructions screen below, which was shown just before the first round started. Crash course in spirit catching. It explained the basic rules and goal of the game, i.e. what you can and can’t touch, what you should and shouldn’t shoot and how to progress. I didn’t arrive at the Bit Bazaar when it started, so I might have missed some of the early birds playtesting the game. The first people I saw playing didn’t seem to have too much trouble figuring out what to do, but as the day went by and more people played, it became apparent that the instruction screen wasn’t doing its job very well. My guess that it was too brief and too detailed at the same time, and that confused people about the rules of the game. It presented all of the shooting and touching rules for each NPC type all at once, but due to the lack of space, the descriptions of each rules were too laconic. By the end of the day, I was back to my old ways, explaining the game myself and skipping the instructions screen, and things went by a lot smoother. Essentially, it’s just a half-size level that plays itself to teach new players how to play the game. 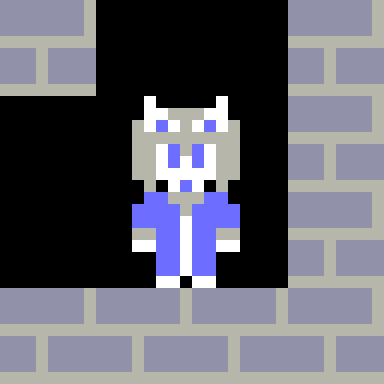 And speaking of playing itself, I’ve also started on making the autoplay system too. I think I’ve got the playback system working pretty well, the recording system on the other hand, which is only here to help me record gameplay to be played back by the autoplay system and may not be part of the final product, has a few bugs to work out. For starters, it generated a 500+ MB output file when it was only supposed to be a few kilobytes in size. The recording code is working much better now. I’ll go into more detail about in a later post, because this one really needs to get out there. I don’t know when, because it’s the holiday season, with the whoop-de-do and hickory-dock. And don’t forget to hang up your sock, ’cause just exactly at 12 o’clock, he’ll be coming down the chimney, down. P.S. Now that I think about it, Donum and Pohena bears some similarities to Sinterklaas and Krampus of Alpine folklore. Krampus punishes naughty children while Sinterklaas rewards good children. Pohena and Donum does the same with spirits, according to the supplementary material. This week, I switched gears and went back to mainly working on Gonna Catcha, in particular the co-op mode. Things have been more difficult than I imagined. You’d think that with a game that screams “CO-OP GAMEPLAY!!! (Oh, and you can play solo too. )” I would have designed and coded the co-op part first or at least made the single-player mode in a way that would be easily expanded to co-op gameplay. But now the code design isn’t as pretty. Oh well, so much for my idealism. It probably won’t matter in the end; I don’t think Gonna Catcha is resource-intensive enough for a few pieces of unoptimized code to have any impact on the performance of the game. When the co-op mode is working properly (for the most part), I’ll upload a video it, but for now, I give you the above. Where Is That Thing You Were Working On Several Weeks Ago Now? Okay, I’ve held off publishing this post for two days now, time to stop writing and actually do it. 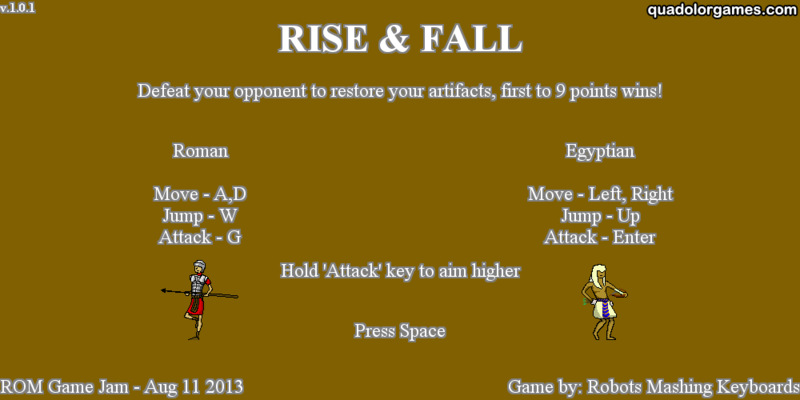 Quite a few things have been added or changed since the ROM Game Jam prototype. The biggest change is the inclusion of jump-through platforms (i.e. platforms that can be passed from below but not above). The original prototype only had completely solid platforms, but to have a greater number and density of platforms in the level, my team decided that we need to have jump-through platforms as well. Seeing how something like this should be Game Programming 101, I should have learned how to do a long time ago, but never did until now. Still, I had to learn it from the source code of this demo by Bill23. Even then, it took me two attempts to get it working right. Other changes are relatively minor, such as adding mercy invincibility, or bug fixes. We will also be changing up some the graphics and adding more levels before the playtest session at the ROM on October 19. It looked as though GameMaker didn’t rebuild the asset cache after I deleted some objects from the project, so the game ended up drawing the wrong sprites and even creating the wrong objects (i.e. 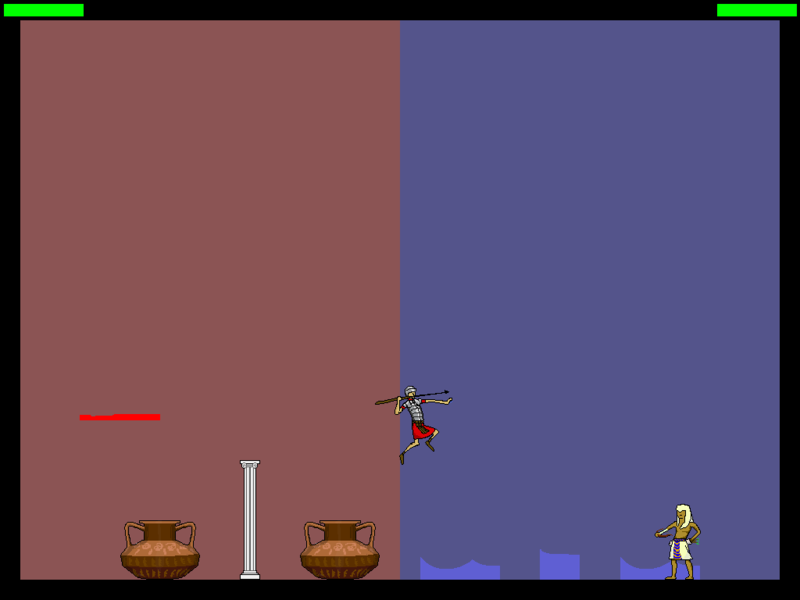 the projectiles seemed to have been replaced with experimental wall section object I had been working on). Clearing the asset cache and rebuilding the game once more fixed everything. Speaking of Gonna Catcha, nothing visually interesting has happened with it since the last update, so no video or screenshots for you. However, I did completely overhaul how the game handles round progression, now incorporating the NPC speed multiplier I talked about last time. Alright, that another task down for Gonna Catcha, what left? I really should make a list of these things. Mid-Autumn Festival –> harvest festival –> harvesting of souls –> psychopomps –> Pohena and DonumFull moon –> werewolves –> wolves –> Pohena and DonumQ.E.D. Increasing the number of NPCs required to be captured and avoided in a round. With the former, I think I won’t have to rely on the latter as much to scale the difficulty as the game progresses, I can ramp up the latter much quicker and make the early rounds less boring. As someone who started gaming on the Famicom and Game Boy and now the owner of a Wii U and 3DS, this news hit me hard. May he rest in peace. Great, now I feel awkward for publishing this post today. This thing doesn’t have Free Play yet. Got any quarters? Alright, it’s the moment you’ve all been waiting for. …Okay, some of you. …Okay, mostly me. After playtesting the game for a bit, I’ve come to realize that the Pohena rounds are too easy. 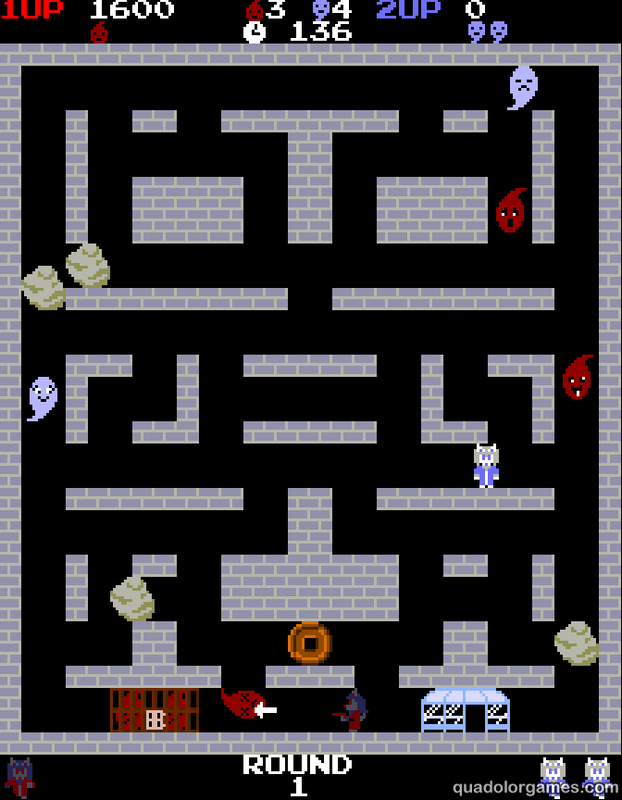 Chasing around the fleeing Bashful Spirits (above left) while avoiding Vengeful Spirits (above right) provides a good challenge in Donum rounds, however the behaviours of the same two spirits make Pohena rounds a breeze. Bashful Spirits generally stay out of your way, reducing chances of friendly fire, while Vengeful Spirits home in on Pohena like lambs to the slaughter. 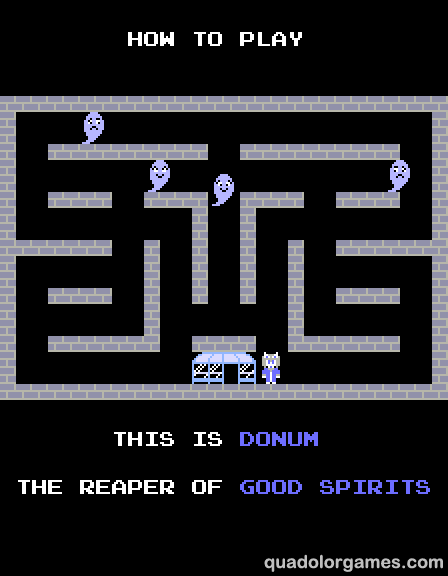 I haven’t put in the Hungry and Vagrant Ghosts in the game yet, but I don’t imagine them making Pohena rounds that much more difficult (they are designed more to be nuisances than threats). 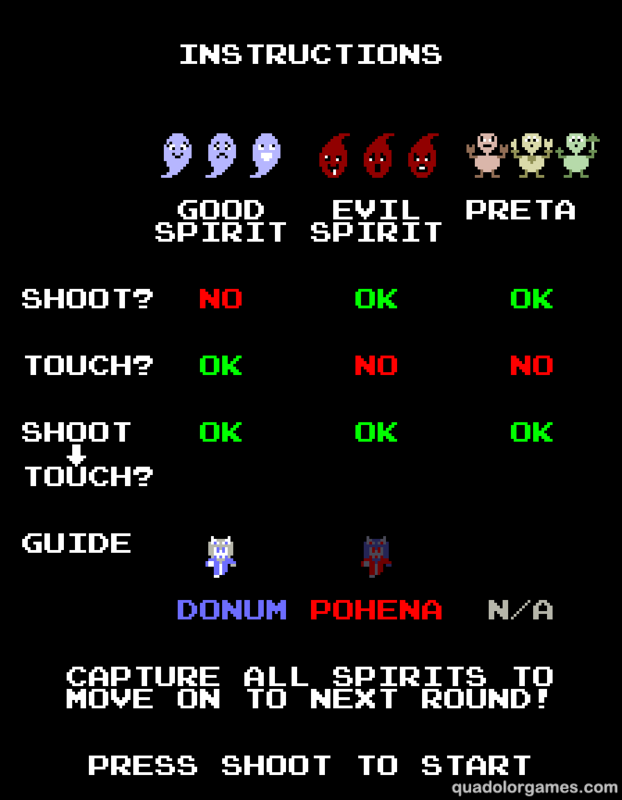 In light of this, I made have to add additional types of spirits, one for good and one for evil, to balance out the gameplay. Find out on the next exciting episode of Dragonba- err, I mean Quadolor Dev Blog. The time between the last post and this one was longer than I expected. I wanted to make a post earlier, but then I started on something neat and decided to hold off posting until I gathered my thoughts about it. The result is a very long post about two topics: old display simulation and an audio engine update, complete with anecdotes of projects I did in the days of yore. Brace yourself. At least there are lots of pictures to look at. I’ve experimented with a few graphical overlays that will make the game window of Gonna Catcha look like an old CRT display. As with the audio capabilities of Gonna Catcha, this is something new to me, so it will require some research. I’ve already found some blog posts that talk about it, but the methods shown used pixel shaders, which GameMaker: Studio doesn’t support (well, at least not yet). …and this full-resolution frame takes about 18 seconds to render. Yeeeah, I think I’ll stick with the built-in 3D functions for now. 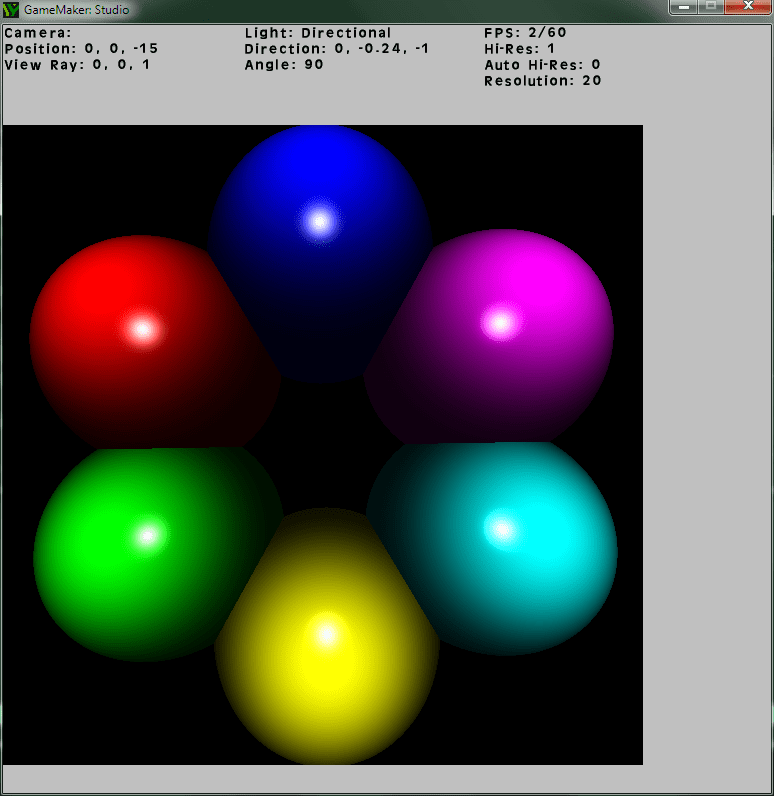 As interesting and colourful as my raytracer is, we should be going back to Gonna Catcha now. Since I currently can’t use shaders, I’ll just have to make due with using foreground overlays and GameMaker‘s blending modes. Below are some screenshots of the game with and without the various experimental overlays. Click to magnify the screenshots, as the effects can’t be seen in the thumbnails. So far, I like “LCD?? 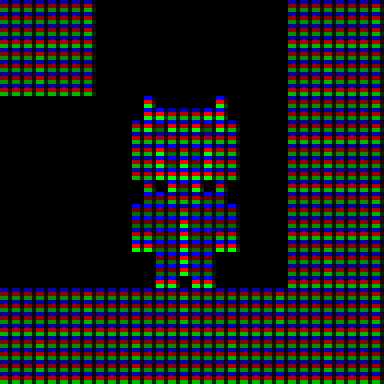 ?” the best, followed by having scanlines only, but both are still not quite the CRT look I’m looking for. Nevertheless, I’ll continue to soldier on. In other news, BASS, the audio library I’m using for both Gonna Catcha and That Which Binds Us, has been updated to version 2.4.10, and I’m three and a half months late to the party. This meant that I needed to update BASSGMS, my wrapper library that makes BASS and GameMaker understand each other, as well. Oh, and I know very well the troubles that can occur with incompatible libraries due to version differences. Yes… very well. When I was doing my Master’s at UOIT, I used BASS and a precursor version of BASSGMS for one of my projects. One day, my project kept crashing on my lab machine, yet it ran perfectly fine on my home computer. I spent a long time looking over my code and even inserted test and debug functions into it to make sure the outputs were correct, but no matter what I did, the program still kept crashing in the lab but not at home. I forgot what gave me the idea, but after several hours I decided to look at the version numbers on the BASS DLL on both the lab and home computers. It turned out that the DLL on the lab machine was a few revisions behind, so I downloaded the latest version of it and, lo and behold, the program stopped crashing. And then I was enlightened. So anyway, I fired up Visual C++ and recompiled BASSGMS, no problem here. I also took the opportunity to give GameMaker more control over BASS by add more functionality to BASSGMS. In the end, I created a GameMaker:Studio application to test out the new and improved BASSGMS 0.3, which does things that are probably not even needed in my current game projects, like tempo control and monitoring CPU usage, but it’s still nice to have them there for future projects. Not captured in picture: animated, cycling rainbow effect. Most likely not need in either project.